In stock in a few select colors. Call or chat for pricing and/or ordering instructions. Stressless Skyline Large Recliner with Ottoman with Classic Base- True Relaxation Starts Now! Now is a great time to save big on the world's most comfortable recliners. 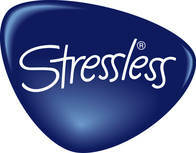 Unwind brings you the lowest prices allowed on all Stressless Recliners. Choose your favorite leather grade, pick one of the fabulous colors, and match it perfectly with an amazing accessory if desired. Why not add an accessory to your Skyline Large? Choose one of the following accessories: the ultra-convenient Personal/Laptop Table, the useful Ellipse Table, the stylish Urban Table, or the fan-favorite Elevator Ring set. Pricing is reflected automatically when you make your leather/fabric selection from the swatches above. Need assistance- Please call 1-888-486-9463. Enjoy Fast, Worry-free Delivery on a Stressless Skyline Large Recliner with Classic Base and Ottoman. Start relaxing in your beautiful new Skyline Recliner sooner with our Quick and Easy Shipping Methods. This popular, modern recliner delivers exquisite head, neck and back support and the over-stuffed smooth, soft, cushioning allows you to sit undeterred for many hours on end. 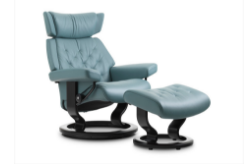 The Stressless Skyline recliner is among the most modern Stressless recliners available. Choose your preferred leather or fabric types and colors from a pull down menu above, which is titled: "Select Leather or Fabric Type and Color". Then choose from the beautiful wood stains. Typically, we keep all stains in stock. We are proud to announce the latest information regarding new models, changes, additions, and farewells to the Ekornes Furniture and Stressless Recliners for 2016. This information was just announced and we wanted to bring it to you as quickly as possible. Be on the lookout as most of these changes will take effect in 2016. There are so many that some will still be coming in Winter 2016. I like the look of it, it looks so cool to me, and is still comfortable- Kinda retro.